Hello, all! I have decided to do a three part series. I made 3 delcious things yesterday, but I think that this is just too good to put in one post. Today I’ll be posting about piquillo (or pequillo) pepper hummus (the happiest mistake I’ve ever made). Next, I’ll post about the pita bread I made to go with the hummus. Lastly, I’ll post about the stuffed pita I made when I realized my planned dinner had gone bad in the fridge (the second happiest mistake I’ve made). These recipes are all very delicious and can be made with minimal effort and, except in the case of pita bread, minimal time. So without further ado, I give you the story of why piquillo pepper are in hummus. I have been trying to clean out my pantry in attempts to make more space. In the back of one of the shelves I found a jar from Trader Joe’s of Piquillo Peppers. “Odd,” I thought to myself, “What did I want to make that involved piquillo peppers?” I put them in front to remind myself to figure out something to do with them and continued with my cleaning and baking. As I was making the pita bread, I reached for my sugar behind the peppers and… *CRASH* The pequillo peppers fell out and the bottom of the jar broke off. Luckily the glass did not shatter. “Ok…. I guess I’ll use these today.” So I decided to try to make some hummus to go with my pita and add the piquillo peppers. Maybe like roasted red pepper hummus? Turns out, it’s a million times better than roasted red pepper hummus. Why have we been using red peppers when we could be using these superior peppers? 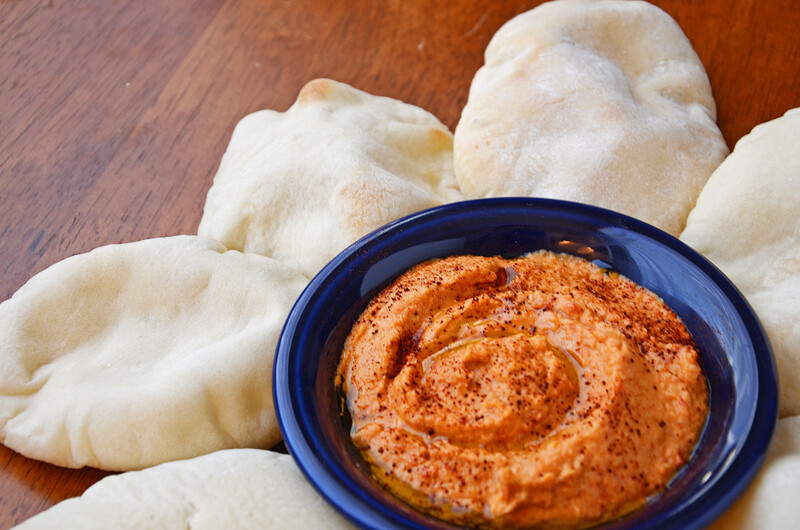 If you like roasted red pepper hummus, you’ll like this even more. I will never be buying store bought hummus again and I most definitely will be using piquillo peppers whenever I can. Give this recipe a try, you’ll be happily surprised. Combine all ingredients except the last two (olive oil and chipotle pepper) in a blender or food processor. Scrape sides occasionally to ensure that all the garbanzo beans are blended. Pour into a bowl. Create a little well in the middle Cautiously sprinkle the chipotle powder, if using, over all the hummus. Too much can make your hummus REALLY have a kick. Pour the olive oil into the well. Serve with fresh pita (recipe below) or pita chips. Hummus will last a few days in the fridge covered. Note: To make regular hummus, simply do not add the piquillo peppers or paprika (but you’ll be missing out). This hummus is delicious and nutritious so don’t forget to go for second (or third, or fourth….) helpings! Posted on December 9, 2011, in Appetizer/Side, Recipe and tagged appetizer, food, hummus, party dish, photography, side, vegan, vegetarian. Bookmark the permalink. 3 Comments.